Quattro Foods, one of the UK’s leading ambient food suppliers, is a place where people are passionate about food. We create delicious and convenient food products for the wholesale and retail sector, striving to combine premium ingredients with innovative production methods to save professional chefs time in their own kitchens. Providing ambient products to the foodservice industry, who in turn supply retail outlets, cafes and restaurants, the Quattro Foods team instils passion and pride into every product. What is ambient food? Quattro Foods ambient range consists of delicious, tailored and convenient ingredients and ready to use sauces – a vital component for commercial kitchens working in large-scale food production. Designed to reduce preparation time and increase shelf life, ambient products are made using traditional production methods and premium quality ingredients. Making life easier for busy chefs in large commercial kitchens, ambient products made in the Quattro Foods kitchen are delicious and convenient. Ready to use in meat dishes, salads, sauces and pasta dishes, these products offer exceptional value and time-saving food solutions. Making premium quality food on this scale is a mammoth task and life at Quattro Foods is always busy. So what goes on here at Quattro Foods? Our beating heart and soul is our state of the art kitchen. Always buzzing with frenetic yet organised action, our team of chefs ensures that this spotlessly clean, nut-free zone operates with military precision for maximum efficiency, yet retains traditional home-cooking methods for outstanding results. Our customer facing team enjoys working with customers, new and old, discussing their needs, agreeing requirements and fulfilling orders. The first step is a consultancy process where the customer meets the Quattro Foods team in order to find out how they work and what their customers are looking for. We work together to come up with products, flavours and styles that fit their needs best. Once we agree requirements and quantities we set out to fulfil the order to deadline and on budget. We are as passionate about serving our customer as we are about creating their food. 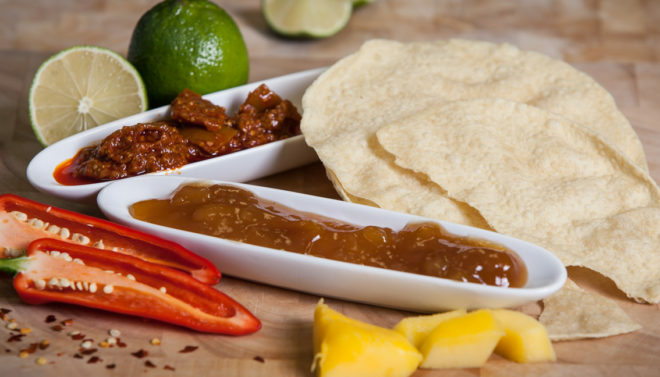 Our full range of ambient products includes garlic puree, pesto, korma sauce, chilli con carne, tomato and basil sauce and many more. Hand-cooked with love, Quattro Foods chefs use home-cooking methods to create premium products. We are unique amongst food production companies as we steer clear of mass production methods when creating ambient products yet we continue to maintain the highest standards in our production of 10-12 tonnes of ambient food a day. For quality and versatility from made-to-order food solutions for the restaurant, retail and wholesale sectors, Quattro Foods ambient range has established us as market leaders. The best local produce combined with the skills and passion of some of the country’s most talented chefs.